Fluid resistant outer layer with white, extra soft, hypoallergenic cellulose inner layer. Void of all inks, dyes and chemicals - will not lint, tear or shred. Unique No-Fog strip. Designed specifically for people with sensitive skin. 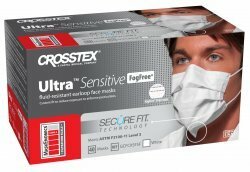 Crosstex masks meet Low (Primary), Moderate and High ASTM* performance classifications, based on: fluid resistance, filtration value, breathability and flammability.